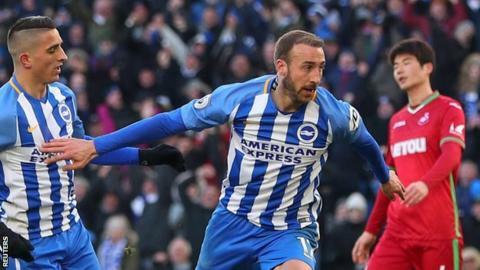 Glenn Murray scored twice to help Brighton & Hove Albion to a comfortable win as they eased their relegation worries - and increased Swansea's. Murray opened the scoring from the penalty spot after he was clumsily fouled by Mike van der Hoorn, before combining with Jose Izquierdo for his second. Anthony Knockaert, who had earlier had a goal ruled out for offside against Murray, added a third after a neat exchange with Pascal Gross. Late on, Swansea got one back when Tammy Abraham's effort deflected off the unfortunate Lewis Dunk for his fourth own goal of the season, before Jurgen Locadia, on as a substitute for his Premier League debut, completed Brighton's victory. In truth, the scoreline did not flatter the south coast club, who achieved back-to-back Premier League wins at home for the first time since September. Chris Hughton's side are up to 11th in the table, four points clear of the Swans, who drop back into the relegation zone in 18th. Given the unpredictable nature of this season's relegation battle in the Premier League, Brighton's win was a real statement of intent. They controlled the match from start to finish. Defensively, they restricted Swansea to just one shot on target, with the Welsh club often forced to settle for shots from distance. In attack, intricate passing between the likes of Gross, Izquierdo, Knockaert and Murray allowed them to carve the Swans open, particularly with the home side's counter-attacking form. The Seagulls have lost only three of their 13 home league games this season - and those defeats were against Manchester City, Liverpool and Chelsea. This result means they are now unbeaten in six in all competitions, a record they will hope to extend when Arsenal visit the Amex next weekend. It's not all doom and gloom for Swansea, who have undeniably improved under Carlos Carvalhal, but this was a shattering way for their 10-game unbeaten run to end. Ahead of the match, Brighton boss Chris Hughton had called the Swans "well organised", but it was not a billing they lived up to on the Sussex coast. They also missed out on equalling a club record equalling fourth Premier League away game without defeat. An equaliser at that point may have changed the balance of the match, but there was only going to be one winner after Murray buried his and Brighton's second. Carvalhal did react to Brighton's dominance by using all of his substitutes with little over an hour played, but it simply wasn't their day as the Seagulls completed a league double over his side. "It is a really good performance. The game opened up in the second half. They decided to change, which made it a more open game. One side usually benefits when that happens and we benefited more. "That has to be on the back of a good defensive display and we were well worthy of the win. "At the moment, though, we look as though we can score a goal." "The story is we tried to turn it around by putting more players into attack in the second half because we were losing and we wanted to win three points. "We reacted well to their first goal. We took a player from midfield and put them up front, we knew that was a big risk. We'd either win the game or the opponent would score. "We took those risks very early. In hindsight, I'd have made the change with Tammy [Abraham] later. That's football, though. It was a high-risk bet." Brighton scored four goals in a game for the first time ever in the Premier League and the first time in the league since February 2017 (4-1 v Burton Albion). Only three Englishmen have scored more Premier League goals this season than Glenn Murray (10) - Harry Kane, Raheem Sterling and Jamie Vardy. Jose Izquierdo has been directly involved in a goal in each of his last three Premier League games (two goals, one assist), after managing just two goals and two assists in his previous 20 this season. Lewis Dunk has scored four own goals in the Premier League this season - the joint-most by a player in a single season in the competition's history (with Martin Skrtel in 2013-14). Swansea suffered their first defeat in their last six top-flight games (won three, drawn two), conceding one goal more against Brighton than in their previous five games combined. Swansea City return to the Liberty Stadium on Tuesday, 27 February with their FA Cup fifth round replay against Carlos Carvalhal's former club Sheffield Wednesday (20:05 GMT). The Swans are also at home as they resume their Premier League campaign against West Ham on Saturday, 3 March (15:00 GMT); while on Sunday, 4 March, Brighton welcome Arsenal to the Amex (13:30 GMT). Match ends, Brighton and Hove Albion 4, Swansea City 1. Second Half ends, Brighton and Hove Albion 4, Swansea City 1. Attempt missed. Sam Clucas (Swansea City) left footed shot from outside the box is high and wide to the left. Assisted by Luciano Narsingh. Goal! Brighton and Hove Albion 4, Swansea City 1. Jürgen Locadia (Brighton and Hove Albion) left footed shot from very close range to the centre of the goal. Assisted by Dale Stephens. Attempt missed. Dale Stephens (Brighton and Hove Albion) right footed shot from the right side of the box is close, but misses to the left. Assisted by José Izquierdo. Own Goal by Lewis Dunk, Brighton and Hove Albion. Brighton and Hove Albion 3, Swansea City 1. Attempt missed. Tammy Abraham (Swansea City) right footed shot from outside the box misses to the left. Assisted by Lukasz Fabianski. Attempt missed. Ezequiel Schelotto (Brighton and Hove Albion) right footed shot from outside the box misses to the right. Assisted by Davy Pröpper. Attempt missed. Ki Sung-yueng (Swansea City) right footed shot from outside the box is high and wide to the right. Attempt blocked. Martin Olsson (Swansea City) left footed shot from the centre of the box is blocked. Assisted by Luciano Narsingh with a cross. Hand ball by Tammy Abraham (Swansea City). Goal! Brighton and Hove Albion 3, Swansea City 0. Anthony Knockaert (Brighton and Hove Albion) left footed shot from the centre of the box to the centre of the goal. Assisted by Pascal Groß with a through ball. Goal! Brighton and Hove Albion 2, Swansea City 0. Glenn Murray (Brighton and Hove Albion) left footed shot from the centre of the box to the centre of the goal. Assisted by José Izquierdo. Hand ball by Federico Fernández (Swansea City). Attempt missed. Glenn Murray (Brighton and Hove Albion) left footed shot from the left side of the box is close, but misses to the right. Assisted by José Izquierdo. Tom Carroll (Swansea City) wins a free kick in the attacking half. Sam Clucas (Swansea City) wins a free kick in the defensive half. Foul by Ezequiel Schelotto (Brighton and Hove Albion). Tom Carroll (Swansea City) wins a free kick in the defensive half. Attempt missed. Davy Pröpper (Brighton and Hove Albion) right footed shot from outside the box misses to the right. Assisted by Pascal Groß. Hand ball by José Izquierdo (Brighton and Hove Albion). How did Lawro get on against 'I, Tonya' stars?